Perfect for take-out restaurants, stadiums, outdoor barbecues, and more, these Choice medium weight individually wrapped white plastic forks will exceed your serving needs! Wrapped in a clear poly wrapper, each fork is shielded from contaminants, maintaining its sanitation during storage and transport. Complete your plastic cutlery settings, or use them to fill your flatware bins at your snack shack or concession stand for easy take-out or grab-and-go applications. Made of durable polypropylene, these disposable forks are strong enough to last through your meal service, and can be easily disposed of, making cleanup a breeze. I brought these for my bakery for ppl to use with a slice of cake or cheesecake. They are only good for desserts. Get the heavy duty if you need for dinner purposes. Great value for the price. We use these as self-serve for our food truck with no worries about people touching all of them and the health department loves that they are wrapped. We catered an event and These forks really came in handy for the rush they Had for their grand opening. They were very sturdy. I would purchase again in the future. They are a bit flimsy but good enough for cakes, salads and general uses. It's also individually wrapped! A good buy at these price for our cafeteria! Probably the best individually wrapped forks I have come across. They are small but not so small that you feel like it's a kids fork. They have good weight to them and the packaging is thin, very easy to open. I first purchased a small pack to test and, since, have purchased a case. I was looking for economical wrapped utensils for my cafeteria use and this was it. Good quality and good price. Three stars because these are not necessarily bad, it just depends on what you're using them for. These medium weight plastic forks work well for soft, simple things like a soft piece of cake or pie, but are less-than-stellar for eating a fried chicken breast. I really love websturant store and a lot of their items but this item needs to be disconnected. This fork bends in half when trying to use it. They need to revisit this item. These medium weight plastic forks by Choice are a great value! They are individually wrapped so they stay clean and convenient for transporting them or leaving them in bins for your customers to grab. Good quality for most foods. The individually wrapped medium weight white plastic fork is of average quality. Thin and a little flimsy, but it surprisingly didn't break when I used it (to eat a cupcake). The individual wrapping worked fantastically for what I needed it for, but the forks are tightly pressed into the box and require a little more effort to peel from one another. Also, I found a lot of extra plastic pieces in my box (like spare fork wrappers stuck to the wrapped forks). I would recommend a higher weight to use for catering or weddings. These were decent to serve with my cupcakes. These are not the sturdiest of of plastic forks but you can not beat the price. I would not use them for for anything other than salads and sides. I was fooled by the term medium weight and thought they would be thicker than they were. These are what I would call light weight. May be usable depending on your application. We bought these forks for our office and love them. They are strong enough for everyday use and since they are individually wrapped they stay clean. These forks are really great especially because they are wrapped so I don’t need to be concerned about them staying clean for my customers. Highly recommend them!! These white medium weight forks are great for restaurants, picnics, or any other event where you need plasticware. Although they seem a little flimsy, They are a great value for the price. Purchased these for our macaroni pie side dish. They were a fit flimsy for picking up noodles. Had to purchased heavy duty forks from Walmart temporarily. Next time I would order the heavy duty one. Good forks for the price. They are indeed medium weight so don't expect the world from them but great for salads and veggies and such. Money saver. Unfortunately, my customers disliked this product. There were complaints of it breaking easily. It was flimsy and bendable. Heavy weight is way better than medium weight. We appreciate your review, Shafane! If you ever need a recommendation for a different product, please contact our Customer Solutions team. Very affordable quality fork. Doesn't bend and prongs are sturdy enough for single use. Individually wrapped for sanitary purposes. Bright white color. Highly recommend this product! Great little fork for our pasta salad and coleslaw. Not heavy duty, but sturdy enough for the price. We use it for deliveries for pasta salad, Slaw, or salads. I love the price point of these! Same quality as the other Individually wrapped forks I was getting but half the price. Our customers use them for salads mostly. Good item for the price but I recently switched to the heavy weight and found it to be much sturdy her but this is fine for simple light eating. Great product for everyday table use. I get a better price from the WebstaurantStore than any national distributor. When I combine mutable items I get a reasonable shipping cost. Although I like how these are individually wrapped to avoid any type of contamination from people touching the forks, these forks are not that durable. We are so glad to have forks again and the price was right to move away from the dreaded spork. it is great to be individually wrapped as well. These medium weight utensils are great for take out applications. Individually wrapped saves on costs over utensil kits since some orders only require a fork, knife or spoon- not all three. These are great quality and not the flimsy ones that you usually get from places! Will definitely buy again and again! Great product as usual! I wouldn't use these for a sturdy meal but they work fine in our coffee shop for baked goods, we haven't had any break but I think they would with a piece of meat. I like that the spoons are in a plastic wrapper and good enough where it would not tear easily. The spoons itself to me feels a little flimsy. Not so heavy as I expected, but still great individually wrapped planstic forks. Noticed that that's a good price comparing to other brands. To sum up, good quality for good price. These forks are sturdy enough for our bakery guests. I'm sure they appreciate that they are individually wrapped. Plus, at this price, they can't be beat. These little forks are great for my bakery business. I don't sell many items that require utensils, but occasionally people want to share a cupcake. They are convenient, inexpensive, and I love anything individually wrapped. Having these individually wrapped forks were great.. the only down side was that some of the forks were sealed with the plastic so I always had to throw those away. This product is so so. It is more for family picnics then for a business. I do lake the wrapped sleeve but over all I would really go with a more heavy duty work. These are a bit flimsy but you can't really complain at this price. We use them mostly for large events like festivals where we have huge crowds and people are eating softer items. These forks worked great for my clients boxed lunches. They were convenient and a good quality considering the price paid. I would purchase them again. Why pay more? These plastic forks for the money can not be beat. they are very sturdy and do not break like a lot of others. I bought these forks to take with my lunch to work. They work well for my purchased intention. I no longer lack an eating utensil and do not worry about having to have water to clean a stainless steel fork from home. these are great for the money...not heavy enough for your chicken BBQ maybe, but perfect for basic go salads and other lunch menu items that need utensils. Not as sturdy looking as I was expecting but it does the job for eating fresh baked cinnamon rolls and lemon bars. packaging is good though. Good quality forks, always in stock and the best price I was able to find on the internet. I like that they are individually wrapped. Just like the forks you get from the food company but considerably cheaper! The forks are packed so well on this case that the box is considerably smaller than most the other brands I've bought! Excellent buy for the cost. Standard fork size and hols up well with chicken gizzards or chili cheese fries and everything in between! Would recommend this product! These individually wrapped forks are just the thing when I am working festivals and street fairs. They are good quality and easy to grab and go. you see this a take outs restaurant. 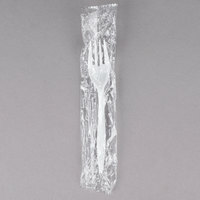 the Individualy wrapped medium weight plastic fork. good in quality, and sturdy, and what a great buy. thanks websaurant. Tried to find wrapped forks from my other distributors but they wanted at least double what you charge. Not quite as sturdy as I'd like but they work just fine for our cinnamon rolls. I have search everywhere for just an individually wrapped fork. Most restaurant supply store sell the nap-paks. It's a waste if you plan on only using the fork. So glad I found these. Good quality, sturdy utensil. We serve a variety of food, all of which can be eaten with just a fork, so the individual wrapping makes use at vending sites very easy for both MacDaddy's staff and our customers. Will definitely be reordering! Very good product! Individually wrapped which we love! Medium weight is what we needed for our breakroom. Have not had any complaints from any employees.